Can the jury-rigged arrangement between the US economy and its governing bodies last? World War I extinguished that hope. It also initiated a period of frenetic innovation among Fed officials scrambling to comprehend a changed order. “I am frank to say that we knew mighty little about it,” recalled the first head of the Federal Reserve Bank of New York. Even so, ignorance didn’t prevent the Fed’s directors from wielding influence. After the war, as Wilson’s cherished League of Nations languished in the Senate, monetary tightening induced by the Fed caused a wave of deflation that spread across the globe and curtailed radical movements on both the left and right—a transformation of geopolitics as significant as anything Wilson had envisioned for his parliament of man. A decade later, misguided policy-making at the Fed pushed the United States further into the Great Depression. During Franklin Roosevelt’s presidency, the bank retreated. Fearful of losing what authority they still possessed to the Treasury, Fed staffers had little firepower in departmental turf wars. Their position eroded further when real conflict broke out with World War II, and monetary policy was subordinated to the effort to prop up government finances. By 1945, the Federal Reserve was weaker than at any time in its history. Inflation supplied central bankers with a rationale for reclaiming their lost clout. Though persistent inflation is an accepted fact of life today, in the middle of the 20th century it was still a novel phenomenon to Americans. Prices had risen and fallen across the 19th century, but they had demonstrated more stability over longer horizons: In the United States, the price level in 1910 was about the same as it had been 40 years earlier. Inflation hadn’t figured into the debates over the Federal Reserve’s creation, because legislators assumed the gold standard would determine the price level over the long run. But decades of change—the breakdown of the gold standard, the ascent of robust welfare states, and the growing conviction that small increases in inflation could boost employment—had created an environment more vulnerable to climbing prices. With the shadow of the Great Depression still hanging over economic debates, inflation appeared a small price to pay for steady employment. The calculus shifted in the 1970s. Inflation was escalating, and unemployment no longer seemed as great a threat to a government’s legitimacy. Alan Greenspan, head of Gerald Ford’s Council of Economic Advisers, was shocked during his tenure by the complacency that greeted rising joblessness: “Anyone who could have foreseen 9 percent unemployment,” he recalled, “would have expected massive demonstrations and barricades in the streets.” Instead, discontent centered on rising prices. At a moment rife with complaints about unruly electorates and the spineless politicians who appeased them, transferring authority to central bankers promised to restore sanity by removing the politics from policy-making. At the same time, it passed responsibility for the pain inflicted by monetary tightening onto bureaucrats unaccountable to irate voters. Paul Volcker’s Fed proved Burns wrong. Under Volcker in the 1980s, interest rates soared while inflation tumbled and unemployment spiked above 10 percent. All of this came as a surprise to Jimmy Carter, who had chosen Volcker because of his experience with international finance, not to lead a crusade against inflation. The Fed had engineered monetary contractions before, but it had receded in importance when the economy revived. Under Volcker, it assumed new significance during the downturn, and it held on to that status in the boom that followed. Those anxieties waned under Alan Green- span’s watch. Average growth rates were lower than during the postwar boom, but stability was greater and inflation controlled. Even former opponents marveled. Asked to explain the Fed’s improved performance, Milton Friedman, for once, struggled to express himself. “I’m baffled. I find it hard to believe,” he said. In the 1960s, Greenspan was a skeptic of Keynesians in Washington who believed fiscal policy could tame the business cycle. Thirty years later, he used monetary policy to achieve the same goal. Deregulation was the order of the day, but there was one object that could not be trusted to markets: the economy itself. Greenspan was a different kind of expert operating a different set of instruments, but this acolyte of Ayn Rand had turned into the country’s unofficial economic planner. Central bankers had become Keynesian ghosts in a supposedly neoliberal machine. Ben Bernanke came closer than any economist to fulfilling that dream. Plucked from academic obscurity in 2002, when George W. Bush named him to the Fed’s Board of Governors, Bernanke was best known outside his discipline for having been one of the short-listed candidates for provost at Princeton, where he chaired the university’s economics department. After his first tour at the Fed, Bernanke moved to the White House, where he led the Council of Economic Advisers, pulling off the difficult trick of winning Bush’s approval while maintaining credibility with his fellow economists. In 2005, when Green- span’s tenure was coming to a legally mandated close, Bush viewed Bernanke as a safe confirmation bet. Inheritor of a political history that had turned the Fed into the world’s pre-eminent site for economic management and an institutional history that delivered this organization into the hands of economists, Bernanke embodied the new model of economic policy-making. The foundations of that model began trembling even before Bernanke took office. Under his watch, it took frantic improvisation to stop the US financial system from collapsing and taking the rest of the global economy down in its wake. It was a terrifying moment, but also one that economists were prepared to confront. Modern economics was born out of the trauma of the Great Depression, and although the financial crisis took Bernanke by surprise in 2008, his profession had supplied him with guidelines for responding to it. Today, it appears that averting catastrophe was the easy part. While the sense of immediate danger has faded, there is mounting concern about what comes next, and little faith that either the Fed or the rest of the economics profession can provide guidance during the next slump. Politically vulnerable and intellectually adrift, the economic-policy regime is weaker than at any time since the 1970s—and the ground is again starting to shake. In 1991, a commission established by the American Economics Association issued a warning: Economics departments, it cautioned, had turned into manufacturers of “idiot savants.” Mathematics had become the vernacular of economics in the middle of the 20th century, but the leaders of this earlier turn were distressed by what the discipline was becoming. Around the same time that faculty in English departments began citing the works of Jacques Derrida to display their theoretical savvy, economists were creating dynamic models with infinite dimensional spaces. Fears about the stultifying effects of this shift were reinforced by interviews with young economists who sounded like artificial-intelligence programs designed to trick questioners into believing they had attained consciousness. “I am still very early on in thinking about what the government is,” said one of the field’s rising stars in 1982. “It is clear that we need rules and regulations; we don’t want anarchy. But which rules…that is not quite clear.” However intimidating the mathematics, politicians would not long entrust their careers to a group that seemed as if it had just stumbled on the idea of the state. Today, economists are more likely to praise colleagues for their empirical ingenuity than their baroque mathematics. Less concerned with the behavior of prices, economists have expanded their purview to cover the study of incentives construed in the broadest sense. Experimental economics has made laboratories and randomized control trials into agents of inquiry, while expanding computer power has turned calculations that once required days of effort by teams of researchers into tasks that can be completed with a few clicks. Meanwhile, the emergence of behavioral economics has opened new lines of communication with psychologists, and led an increasing number of economists to discard assumptions about rational-utility maximizers for more complicated models of human behavior. The field covers a wider range of topics—think Freakonomics—but it does so with greater confidence in its analytic core. Economists have left one prominent part of the discipline behind in their forward march. The grandest ideal of economists in the age of Keynes was building a theory capacious enough to grasp the economy in its entirety. That has been overtaken by the attempt to extend the reach of economic logic to an ever-expanding array of microeconomic questions, while adding depth to the field’s interpretation of human behavior in order to bring even more subjects within the realm of the economic. Applied microeconomics, rather than theoretical macroeconomics, dominates. But increasingly sophisticated research on markets has not resolved an ongoing crisis in the study of the economy as a whole. When economists who were graduate students at the time describe this era, they can sound like children remembering a messy divorce. Those who entered macroeconomics spent much of their careers trying to repair their field’s damaged union. The pressure for conformity was, and remains, high: Internal debate threatens the field’s understanding of itself as a scientific discipline and undermines its reputation in the outside world. By the turn of the century, macroeconomists had reached what a much-cited article described as a “new synthesis.” Widespread acceptance of a specific kind of economic model—dynamic stochastic general equilibrium, or DSGE—provided the basis for an intellectual rapprochement, and for a political economy that retained a place for countercyclical economic management. DSGE models require simplifications that even their proponents admit strain credulity, but these assumptions allow them to produce models of great mathematical sophistication, trading empirical precision for theoretical rigor. In the summer of 2010, the barrage grew loud enough to prompt the House of Representatives to hold a hearing on the failures of DSGE models and consider what a committee report termed more “realistic” options. The most celebrated of the economists who testified that day was Robert Solow, a living reminder of a time when macroeconomists were the discipline’s intellectual elite, and when the most sophisticated economic theory shaped political practice. Commenting on the dismal reputation that macroeconomics had since acquired in his own department, Solow described himself as “horrified” by the aversion to the subject among graduate students. The latest issue of The American Economic Review might have less to offer the perplexed government official, but those officials are more and more likely to be economists. A close-knit community of policy-makers reaching across the globe has emerged that requires fluency in two languages: English and economics. A 1998 survey of government leaders in 160 countries found that about half of them had an economics degree, and that 16 had a doctorate in the subject from a university in the United States or Europe. Central bankers are even more likely to include economists in their ranks. By the 1990s, about a third of central-bank heads had been trained in the United States. These banks had their own teams of researchers, but not even they could rival the World Bank, which had some 800 economists on its staff. In the United States, however, no agency rivals the Federal Reserve. The Fed spends hundreds of millions of dollars on economic research every year, and probably employs more economists than any other organization in the country—over 200 in Washington alone, and about 250 more in the regional banks. In 2009, The Huffington Post reported that almost half of the editorial-board members at seven major economics journals had a relationship with the Fed. Inevitably, the bank’s patronage shapes the direction of research. This is not a matter of outright coercion; the rewards are subtler, the pressure more diffuse. “I think it’s more being one of, part of, a club,” one economist said. The Fed wasn’t always such a lavish benefactor. In 1949, a majority of the members on the Federal Open Market Committee, the body within the Fed charged with setting monetary policy, had trained as lawyers, and only one had a doctorate in economics. By 1994, the numbers had reversed: Seven had done graduate work in economics, and only one had a law degree. Bernanke, the lifelong academic, was part of the trend. After graduating from Harvard, where he won an award for best undergraduate economics thesis, he moved to MIT for graduate school, completed his doctorate in four years, headed to Stanford for his first job, and was then hired away by Princeton. While Bernanke was at Princeton, one of his colleagues on the faculty, Alan Blinder, left to become vice chairman at the Fed under Greenspan. At the time, Blinder’s academic career trajectory set him apart from his new colleagues, as economics PhDs had often spent their careers inside the Fed. But then Janet Yellen, a Berkeley professor with a doctorate from Yale, followed him. After that, Blinder recalled, “the floodgates opened. Now it’s normal, even expected.” Yellen, Bernanke’s successor as Fed chair, met her husband, the Nobel-winning economist George Akerlof, while both were working at the bank in 1977. When she later came up for Bernanke’s position, her chief rival was Larry Summers. In 2005, when George W. Bush was contemplating Greenspan’s replacement, media accounts reported that he also considered three other academic economists—Glenn Hubbard of Columbia, John Taylor of Stanford, and Martin Feldstein of Harvard, whose introductory economics course Bernanke had taken some 30 years earlier. Ties among economists are strengthened by regular meetings, and for students of monetary policy, the most important is a multiday conference in Jackson Hole, Wyoming. Sponsored by the Federal Reserve Bank of Kansas City, the symposium brings together more than 100 economists and policy-makers from around the world. Debates are vigorous, but in the 2000s, a shared framework kept them within narrow bounds. One economist dubbed it the “Jackson Hole Consensus” and identified five key elements: faith in markets, support for central-bank independence, preference for monetary over fiscal policy, emphasis on price stability, and confidence that financial crises were relics of a bygone era. These policies represented the essence of contemporary, policy-oriented macroeconomics—a hybrid field, as much a product of governmental agencies as university departments. Claiming to have distilled the lessons of the 20th century into a handful of prescriptions, economists celebrated the achievements of policy-making in what became known as “the Great Moderation.” The term was first used in a paper presented at Jackson Hole in 2002. One year later, it was introduced to the wider world in a speech by Ben Bernanke. Alan Greenspan was formerly Burns’s student, and just as poor a prophet as his mentor. Greenspan’s account of his tenure at the Fed, The Age of Turbulence, lauded after its publication in 2007, makes for painful reading today. He dismisses concerns about mounting household-debt levels; mentions his “pleasant surprise” upon discovering the reluctance of Fed staffers to make aggressive use of their regulatory powers; and dubs the repeal of Glass-Steagall, the Depression-era law dividing commercial and investment banking, “an unsung moment of policy-making for which there ought to be a little song.” Even more cringe-inducing is an afterword composed for the paperback edition. Written in June 2008, a few months before Lehman Brothers declared bankruptcy, it informs the reader that financial markets “are already repairing themselves.” It also deems new regulatory initiatives “superfluous” and calls inflation the greatest threat facing the world economy in the years to come. Greenspan didn’t mention Bernanke in his memoirs, but he looms over The Courage to Act, Bernanke’s retelling of his time in office. Greenspan retired an icon; after 2008, Bernanke was reviled by much of the country. In the summer of 2009, respondents to a Gallup poll gave the Fed a 30 percent approval rating. By then, Bernanke was grappling with a congressional assault on the Fed’s powers that posed a greater threat to the institution than any it had confronted in his lifetime. A diffident academic chosen for his technical expertise was now asked to be both political tactician and leader of a colossal economic-triage campaign. Part of that mission involved making the Fed more transparent. Long notorious for its secrecy, the Fed in the 1990s began, under pressure from Congress, to open itself to greater scrutiny. Transparency was a price the Fed paid for its newfound prominence. Although Bernanke developed an appreciation for the benefits of secrecy while in office, the move toward transparency in monetary policy, including the adoption of an annual inflation target, continued during his administration. These modest objectives are in keeping with a man whose memories of his college days include many late nights spent playing bridge. Bernanke chose to pursue his doctorate at MIT not out of ideological commitment, but because it had the most respected department. Never one for audacious theorizing, Bernanke’s scholarship had an empirical bent and a practical orientation that set it apart from the mathematical showmanship favored by his peers. 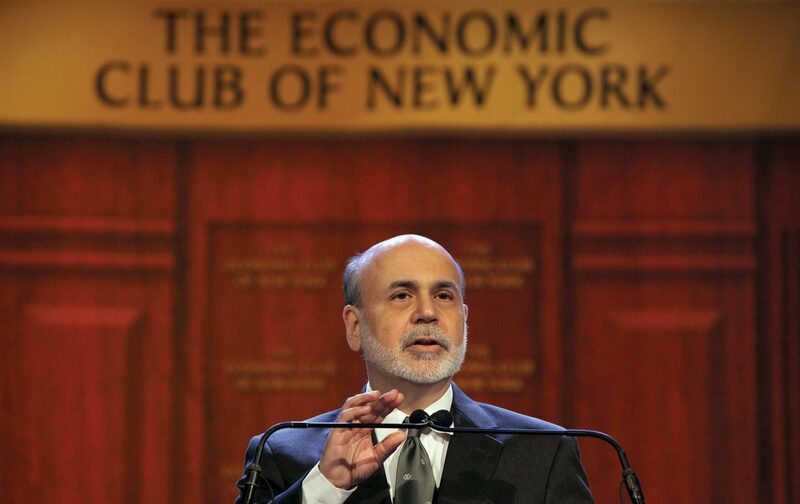 In a field torn apart by dissent, Bernanke seemed a fair-minded umpire. That air of impartiality made him an appealing choice to head Princeton’s economics department, and in 2001 it led to his being chosen editor of The American Economic Review. He would not reinvent economics, but he would provide a judicious synthesis of its current consensus. His disinterested persona was so established that only after his appointment to the Fed did many of Bernanke’s colleagues learn he was a Republican. It is more surprising that he bothered to join any party. Bernanke grew up in South Carolina during the 1960s, and he didn’t attend an integrated school until 12th grade, but the introverted teenager was more focused on his schoolwork than on civil rights (though he did complete most of “a young adult novel about black and white kids forming friendships on a high school basketball team”). At Harvard, he observed the campaign against the Vietnam War “with sociological detachment.” While in graduate school, he watched from the sidelines as Keynesians and their critics engaged in ferocious academic quarrels. He served on George W. Bush’s White House staff but didn’t consider himself part of the conservative movement. What meager political energy he possessed was drained out of him during his time chairing the Fed. Confronted by the widening chasm between Republicans and Democrats, Bernanke stared with incomprehension. His memoir allows a few glimpses of the person underneath the technocratic facade to break though. He calls his time in Greenspan’s Fed “strangely isolating.” “When I didn’t go out,” he writes, “I would microwave a Hot Pockets sandwich and eat it in front of a Seinfeld rerun.” The quality of Bernanke’s diet increased after he became Fed chair—global meetings of central bankers have excellent catering—but so did the anxieties of his job. Most of the book is given over to a history of the response to the financial crisis. Bernanke fades into the background in these pages, which read more like a general survey than a personal narrative. This absence of personality is revealing. Bernanke’s self-portrait of a technocrat without qualities captures the appeal of government by central banker. Throughout his tenure, Bernanke remained popular with his colleagues. He was among the best that the mainstream of the profession had to offer, an emblem not just of the current state of economics but also of a novel style of economic governance that now stretched across the world. More than just a bureaucrat, he became both the symbol of the system and its leader, the high priest of what a reporter for the Financial Times labeled “the cult of central banks.” Momentous transformations in global political economy, entrepreneurial bureaucrats, politicians in flight from democratic accountability, a supportive corporate and financial elite, a weakened labor movement, and economists who claimed they had uncovered the secrets of managing the economy—this tangle of influences came together in the history that turned the former head of Princeton’s economics department into one of the decisive figures of the early 21st century. Though late to see the financial crisis coming, Bernanke moved quickly once he realized its scope. Along with Treasury Secretary Henry Paulson and Timothy Geithner, then president of the Federal Reserve Bank of New York, Bernanke led the effort to contain the damage. Geithner, a lifelong bureaucrat, had spent his career at the nexus of finance and government. So had Paulson, although the former head of Goldman Sachs was anchored on the other side of the divide. It would have been difficult to find better embodiments of the shifting boundaries between capital and the state than these two. Bernanke, the economist in government, represented a newer kind of power. As was frequently noted in 2008, Bernanke had made his reputation as a scholar with his studies of the Great Depression. An already severe downturn, he argued, had been exacerbated by a wave of bank failures: Nearly 40 percent of all the banks in the United States failed between 1929 and 1933. What he called a “financial accelerator” magnified the impact of these failures by choking off the flow of credit. Generalizing from this experience, Bernanke concluded that protecting the financial sector during slumps must be an urgent priority. Bernanke’s Fed took extraordinary measures to uphold that principle during the crisis. Central bankers like to cite the dictum of 19th-century British journalist Walter Bagehot: that during financial panics, they must become the lender of last resort, offering loans at high interest to solvent firms that can post sufficient collateral. After the bankruptcy of Lehman Brothers, the Fed went beyond Bagehot, saturating markets with capital and keeping dying institutions on life support. Working with an intensity that recalled the New Deal at its height, Fed staffers funneled trillions of dollars to the financial sector. Improving on their New Deal predecessors, crisis managers at the Fed orchestrated a global effort to bolster the economy. Central bankers in Canada, England, the United States, and Europe cut interest rates in tandem on October 8, 2008, testimony to the strength of the international community of monetary policy-makers. The Fed backed up these forays in global Keynesianism with massive injections of dollars. By December of 2008, it had lent almost $600 billion to foreign central banks from Brazil to Singapore. Retreating from Bernanke’s commitment to transparency, the Fed kept these efforts out of the public eye, until the drastic congressional action and a lawsuit under the Freedom of Information Act forced their hand. By then, although financial markets had stabilized, the economy was still weak. The Fed had helped stave off a financial apocalypse, but it had not addressed the underlying cause of the downturn. Between 1950 and 2007, the ratio of household debt to income rose more than 400 percent in the United States, with total debt doubling between 2000 and 2007 alone; much of it was used to buy homes, the biggest investment most Americans make. The bursting of a debt-fueled bubble in the housing market was dramatic, especially in those desperate months in 2008 and 2009 when government officials pulled all-nighters fueled by coffee and terror, demonstrating remarkable ingenuity as they scrambled to save global finance from cardiac arrest. But unsustainable debt catalyzed the financial crisis, and the failure to confront it has been the central fact of the disappointing recovery in the years since. The Obama administration never devised a sufficient response to the housing downturn, and even if it had, action would have been constrained by Republican opposition in Congress. Once again, the Fed took up responsibility that the rest of the government had abandoned. With short-term interest rates hovering near zero, the Fed expanded its asset purchases to cover securities that matured over longer terms—trillions of dollars over several rounds of what became known as “quantitative easing,” or QE. Janet Yellen, then Bernanke’s vice chair at the Fed, favored the move, as did the AFL-CIO. Liberal economists—including Christina Romer, chair of the Council of Economic Advisers under President Obama—urged Bernanke to do more. But condemnations of reckless activism drowned out these cries for bolder action. QE provoked attacks from congressional Republicans, widespread hostility from foreign governments, and what Bernanke calls a “tense lunch” with former Clinton Treasury Secretary Robert Rubin. Green- span and Volcker too, Bernanke writes, “were uncomfortable with many of the policies that the Fed pursued during and after the financial crisis.” So were influential members of the Fed, who warned that loose money could lead to more financial instability and rising inflation. For all the drama, QE proved anticlimactic. Banks were flush but cautious about lending, and households reeling from the last blow to their balance sheets were reluctant to accumulate new debts. Inflation stayed quiescent and has fallen under the Fed’s 2 percent target every year since 2012. Low returns on bonds pushed investors to the stock market, exacerbating the disjuncture between Wall Street and the rest of the economy. Concerns about financial instability have grown, as low interest rates have encouraged investors to take on more risk with borrowed money. Meanwhile, dollars flooded the financial markets of emerging economies, threatening to overwhelm systems unprepared for an influx of capital that might depart as quickly as it arrived. According to Bernanke, however, QE’s macroeconomic benefits more than compensate for its potential damage. The recovery has been anemic, but research suggests it would have been even worse without monetary stimulus. By the Fed’s estimates, in its first two rounds, QE lifted economic growth by about 3 percent and raised employment by 2 million jobs. Dismissing concerns about structural problems developing under the surface, Bernanke points to macroeconomic indicators—steady growth, falling unemployment, low inflation—as evidence of a job well done. The United States has outperformed the United Kingdom, the eurozone, and Japan since 2009, and Bernanke remains confident that normal growth rates will return “eventually.” He sees the world through the lenses provided by his training as an economist, and what he sees now is an economy that has weathered difficult years and is poised for better things to come. This vision is comforting but not popular. Although Wall Street has reaped enormous rewards from the Fed’s actions, much of the loudest criticism of Bernanke comes from the 1 percent and its defenders. “The virus of radical monetary intervention,” wrote the business commenter James Grant in one representative example, “has entered the world’s political bloodstream.” Bloomberg View columnist and former Pimco CEO Mohamed El-Erian adopted a calmer tone when he warned that the Fed has created a relationship of “co-dependence” between central bankers and the markets, but he is just as convinced that the time for experimenting with monetary policy has come to an end. Acting to save the financial system might be excused as a necessary evil, but the longer the Fed persisted in its attempt to strengthen the broader economy, the more unpopular it became. Strained by these tensions, the politics of bankers have split from the prescriptions of economists. Despite the controversy, QE was a straightforward application of economic principles endorsed by Milton Friedman, who in 2000 had backed a similar program for Japan. The same viewpoint led Bernanke to oppose the fever for austerity that set in across Europe and the UK after fears of a second Great Depression had passed. “I found the decision hard to understand,” Bernanke writes of the European Central Bank’s monetary tightening in 2011. He was just as puzzled by the drive to punish nations in need of bailouts. Readiness to suspend moral judgments in a crisis had made him comfortable with pouring money into Wall Street, and he felt the same way toward countries that were now denounced for their profligacy. For him, Morgan Stanley in 2008 fell into the same category as Greece in 2014. Former Greek finance minister Yanis Varoufakis, another economist, recognized this kinship. Last spring, Varoufakis told Obama: “You inherited a mess when you came to office, but at least you had your central bank behind you. We inherited a mess and we have a central bank trying to choke us.” On this front, Bernanke had more in common with Paul Krugman than he did with Varoufakis’s nemesis, hard-line German Finance Minister Wolfgang Schäuble. Unlike Krugman, however, Bernanke could set policies based on his beliefs. That capacity also set him apart from Obama, stymied after 2010 by the Republicans in Congress. When it came to looking out for the overall health of the economy, Bernanke writes, “the Fed was the only game in town.” That was true to a large extent before the crisis, and it’s even truer now. Seven years after Lehman Brothers’ bankruptcy, the Federal Reserve has emerged with vastly expanded powers. That would have shocked forecasters in 2009, when legislators in both parties agreed that the Fed should have its authority curtailed. Campaigns to deprive the Fed of its regulatory powers and to give legislators more sway over monetary policy resulted in legislation that tinkered at the margins but made no substantive changes. Republicans have reacted to this development with outrage, Democrats with resigned acceptance—not because either views the authority given to these unelected officials as a challenge to democracy, but because Republicans have adopted a politically convenient stance against countercyclical policies, and Democrats view a strong Fed as a preferable alternative to whatever the Republicans would do. More than a century ago, bipartisan endorsements brought the Fed into the world. Now, partisan stalemate has made an institution that claims to have transcended politics more powerful than ever. Can this jury-rigged arrangement last? Bernanke is optimistic. With the worst behind us, he believes that a wiser Fed stands ready to support the economy as growth revives, providing a repository of expert consensus in a government fractured by partisan demagogues. But for years, the burden of economic management has weighed on the Fed, and there are signs that the institution has started to crack. Independence from political oversight has been a pillar of this policy regime since its inception, but with responsibility for financial regulation increasingly falling on central banks, mainstream economists have recommended limiting this autonomy. The Fed’s independence has always been a fiction. As Bernanke notes, monetary policy-makers believe they have two key audiences: the legislators they’re accountable to, and the financial markets that react to their decisions. But the balance isn’t equal. While bankers have wielded too much influence, legislators have withdrawn too much. Monetary policy can never be apolitical; the right question to ask is how it should be politicized. That is now taking place on both the right and the left. The Fed has been a bête noire of Republicans since Obama took office. In 2012, the party platform held out the prospect of a return to the gold standard, a repudiation of Milton Friedman’s life’s work that Ted Cruz and Rand Paul have both endorsed. Activists on the left have been slower to fix their attention on monetary policy, but protesters affiliated with the “Fed Up” campaign have begun to change that. Their calls for linking a commitment to full employment with programs for weakening the financial sector’s hold on the Fed have been echoed by Bernie Sanders, both on the stump and in an op-ed for The New York Times. Demanding better performance from the Fed, however, misses the more profound intellectual and institutional shift that is under way. Central banks rose to their current positions because they could respond to a particular set of challenges. With both interest rates and inflation running high in the 1970s, central bankers had a problem to solve and a blunt, but effective, set of tools for solving it. Neither applies today. Looking beyond the fluctuations of the business cycle, a growing number of economists are concluding that we have entered an era of secular stagnation defined by low interest rates and the persistent threat of deflation. That analysis has not yet attracted much support at the Fed. In December of 2015, it raised interest rates for the first time since 2006, a move designed to take the Fed off its emergency footing and restore conventional monetary policy. By its own standards, the Fed’s justification for the move was weak. Inflation is still under its 2 percent target—a figure that a substantial body of research suggests is already too low—and the Fed’s directors don’t expect it to hit that target until 2018. Though Yellen has argued that monetary policy should still be loose enough to stimulate the economy, the tightening has come while labor-force participation hovers near 40-year lows. And while the recovery has been weak, it is almost seven years old, and the calendar suggests that another recession might be imminent, especially if bad news from abroad continues to drag the domestic economy downward. Another slump would compel Fed officials to confront an unpleasant choice. In previous recessions, its target interest rate has been cut by an average of 300 basis points, or 3 percent. This interest rate is currently hovering around 0.25 percent, and according to the Fed’s predictions, it won’t climb above 3 percent until 2018. That offers little room for maneuver if recovery falters. If muddling through with conventional tools isn’t an option, and if President Cruz has not revived the gold standard, central bankers would be shoved onto one of two paths. The first would push them farther down the road they’re already traveling. Building on QE’s example, the Fed could ditch the financial markets that acted as middlemen under Bernanke and provide checks directly to citizens. Such a move would erase the line separating monetary and fiscal policy, swapping the bank’s printing press for the government’s ability to run a deficit. In the UK, Labour Party Leader Jeremy Corbyn has called for an even more ambitious program of “People’s QE” that would allow monetary policy-makers to fund increased government spending. These programs would further the consolidation of power under the central bank’s auspices that began in the 1970s, and they have all the appeal of that technocratic fix. Offering a detour around a sclerotic legislature, they promise speed, efficiency, and action. That leaves a more old-fashioned alternative. When states first began claiming responsibility for managing their economies in the middle of the 20th century, politicians opted for fiscal over monetary policy. Changes in the budget approved by legislatures are more cumbersome, but they are also more democratic. The rationale justifying the Fed’s rise was never solely economic: Turning authority for governing the economy over to central bankers provided relief from the difficulty of meeting these challenges as a democracy. Moving beyond an economic policy dominated by central bankers requires more than a new set of rules; it needs a more robust politics. The difficulty of reconciling the technical work of economic governance and the messy realities of electoral politics cannot be dismissed, but faith in expert economists and the wisdom of markets has become even less credible. The odds for such a reunion look grim—but not that long ago, so did the prospect that a career in central banking would lead to anything but obscurity. History can swerve in unexpected directions. Just ask Ben Bernanke.